The travel booking specialist had good (and bad) news for investors in its latest earnings announcement. TripAdvisor's (NASDAQ:TRIP) latest earnings report was highlighted by an uptick in growth as the online travel booking specialist attracted more shoppers to its platform -- particularly those interested in paying for attractions, restaurants, and vacation rentals. The core hotel booking business turned in mixed results, though, which convinced management to lower its revenue outlook for the full year. Here are a few of the key takeaways for investors from TripAdvisor's report. The hotel booking business, TripAdvisor's biggest and most profitable segment, took a step back this quarter. Following a massive self-imposed disruption that started with the rollout of instant booking in 2014, the division had posted an encouraging four consecutive quarters of improvements as the growth pace rose from a 21% decline in early 2016 to a 2% uptick to start fiscal 2017. Management blamed a spike in the volume of shopping occurring over mobile devices as opposed to through desktop computers. That's a long-term positive for the business because it means TripAdvisor has a strong platform in place in the area that will see the quickest growth ahead. After all, mobile-based volume spiked 36% this quarter to reach over 40% of the total base. However, the company gets far less value (about one-third) from a customer shopping on a mobile device than it does from a desktop viewer. TripAdvisor's non-hotel segment is growing into a positive force in the business. Revenue soared 31% this quarter to $98 million as bookings spiked and conversion rates improved. It's hard to overstate how bullish executives are about the long-term prospects of this commentary business. Speaking just on the attractions segment, CEO Stephen Kaufer said in a conference call with analysts that the division has a "phenomenally large" addressable market. "As you grow in scale and as more people get used to booking online," Kaufer continued, "you're looking at a business that basically has almost all tailwinds to it." 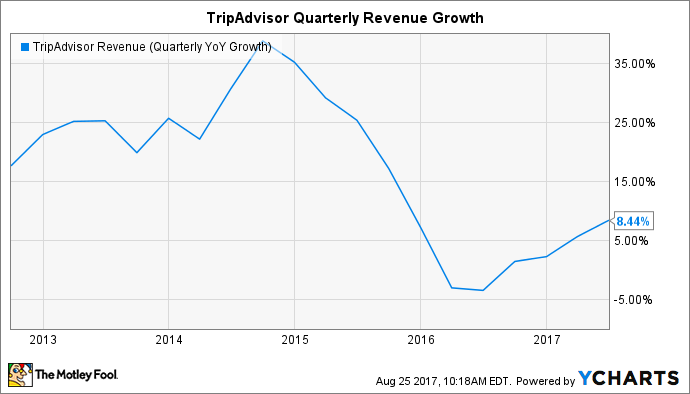 TripAdvisor's surprising profit growth in the non-hotel segment allowed the company to hold its overall earnings forecast for the year steady despite the moderation that's happening on the hotel side. Investors shouldn't expect booming profits from the division for a while, though. Management believes they'll likely be in investment mode for another two years before they can fully pivot to maximizing margins. TripAdvisor now sees the hotel click-based transaction business rising by mid-single-digits rather than the double-digit jump it had predicted back in May. Management is hoping that the company's large TV advertising blitz, scheduled to peak in the current quarter, will combine with all of the site design improvements they've already made to drive healthy long-term growth. They're asking shareholders for a bit more patience, meanwhile, as their hotel business recovery extends into a third year.